Grand Reception Hall with Downstairs W.C.
An excellent, substantial, detached family home situated on a superb elevated site within this ever popular and sought-after development in South East Belfast. Leading local primary and secondary schools are within close proximity and the house is ideally placed for those seeking easy access for the city centre bound commuter. Various fantastic local amenities in Ballyhackamore and Forestside Shopping Centre are close at hand. The property offers generous, adaptable and well-proportioned family accommodation throughout, with three separate spacious reception rooms and four bright double bedrooms - master with en-suite shower room. Modern Luxury fitted kitchen with a separate utility room and a large family bathroom gives this fantastic property that homely feeling. Gardens to the front, side and rear and a detached garage along with a tarmac driveway gives plentiful outdoor space. 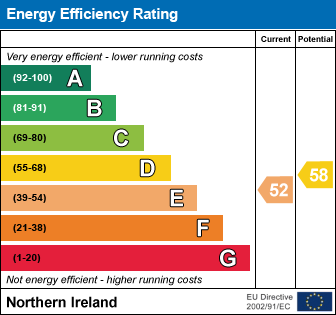 Extra benefits include OFCH and uPVC double glazing throughout. Enjoying panoramic views over Belfast City and beyond, along with leaving the purchaser very little to do expect move in, we recommend internal inspection to fully appreciate all this fine home has to offer. uPVC front door with double glazed side panels, outside light. Oak wooden floor, open minstrel gallery. Storage and cloaks area under stairs. Uplighters. (into bay). Oak wooden floor, cornice ceiling. Feature gas fire with tiled surround and wooden hearth. Oak wooden floor, stain glass effect feature window. Oak wooden floor, cornice ceiling. White suite comprising low flush wc, pedestal wash hand basin with chrome mixer taps, tiled splashback. Chrome towel rail. (at widest points). Range of high and low level storage cupboards. Shelving and work surfaces. Plumbed for washing machine. Space for tumble dryer. uPVC door with access to rear garden. Access to roofspace. Velux window. Hotpress with copper cylinder, built-in storage with shelving. White suite comprising low flush wc, fully tiled shower cubicle with electric power shower. Fantastic views over Belfast City and beyond. Velux window. White suite comprising panelled bath with chrome mixer taps. Dual flush wc, vanity unit with ceramic sink and chrome mixer taps. Glazed shower cubicle with electric power shower. Chrome heated towel rail. Fully tiled walls. Up and over door, side access. Power and light. Gardens laid in lawn with surrounding hedges and mature shrubbery. Brick pavior path to front door. Tarmac driveway for multiple cars. Fully enclosed rear garden laid in lawn with additional brick pavior patio area ideal for summer entertaining. Surrounding hedges and mature shrubbery. Outside light, outside tap, PVC oil tank. Panoramic views across Belfast and beyond. Turn off Outer Ring at Castlereagh Road junction and head up Ballygowan Road. Turn right after first set of lights into Church Road. Marlborough Heights is on the right hand side after Leadhill Primary School. Check out the property I found on PropertyPal.com: 35 Marlborough Heights, Belfast BT6 9QR.